Have you ever noticed the well developed lung capacity and respiratory efficiency of Olympic level swimmers? It’s more than the exercise, it’s the environment in which they exercise. When you are up to your neck in the water, there are changes that take place within and without your body that add new potential to your training and fitness program. Dr. Bruce E. Becker, who has published, taught and researched extensively on aquatics, wrote an article titled “Considering the Biologic Aspects of Water” which was published in April 1995 in Advance for Directors in Rehabilitation. In that article he stated that, “Like the circulatory system, the pulmonary system is profoundly affected by immersing the body to the thorax. Part of the effect is due to blood shifting into the chest cavity, and part is due to compression of the chest wall. What does all this mean? 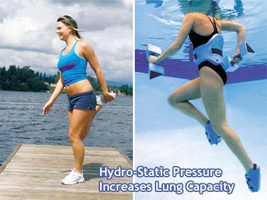 For starters it means that you can get a superior conditioning effect for your lungs and your entire pulmonary system by exercising while being immersed up to your neck in water . Taking your exercise program into deep water with an AquaJogger® Water Exercise Buoyancy Belt lets you maintain that up to your neck position and adds zero impact running, walking, cross country skiing, and a variety of other movements into the equation. This complementary training in deep water can increase your lung power while you perform the activities you already are doing on land. Whether you are interested in being fit for life or at the top of your competitive game, deep water exercise can help you breathe easier and take you to another level of performance.